So Sunday night came and went, Monday day was spent wading through work meetings. Monday night was spent looking for new items for the website. Tuesday dragged - hang on why are talking about this?.... Because it's pertinent to get an understanding of just how mundane life had become before the evening of Tuesday 25th October 2016 came. Yes, that was the night that the Marvel Cineverse altered its destiny. Until this day, Marvel has concentrated on the Avengers build up, with amazing iron men, strong captains to be led by and Hulks or demi gods to engage that geekness in us. However we were not ready for what happened when Doctor Strange burst onto our minds eye, imprinting its stunning effects and delicious magical wares onto our Psyche. The new Star Wars Trailer looked awesome on the large screen, stroking the Star Wars Geek with its slow build up and touch. But this was a mere appetiser, compared to what burst onto the screen after. The film opens quickly with a scene that becomes apparent in its importance later on, we are quickly introduced to the brilliance of Dr Steve Strange (remember him the one Hydra wanted to target in Winter Soldier). Doctor Strange builds slowly and steadily for the first half, reminiscent of Captain America The First Avenger. It skilfully moves us from Steve Strange the Dr to the embryonic Doctor Strange. It has a nice touch building his magical powers one by one and shows their interconnectivity by revealing them only after we have grasped the one on show. Genius. The second part is a phoenix like resurrection of Steve Strange to Doctor Strange, entwined with the Marvel Universe Iron Man humour. Again adding the sections of persona gently and with care to the creation of Doctor Strange, a man becoming a myth. Each addition reveals the magical side to the Marvel Universe littered with enough easter eggs and nods to the comic universe of Doctor Strange to make a geeks heart sob (especially an old one). Benedict Cumberbatch embodies the character, and even has a passable US accent, which will throw UK viewers a little. Tilda Swinton is magnificent as The Ancient One she is both convincing and gives a glowing air of someone with the knowledge of the universe in their head (yet somehow radiates the same quirks of Victor Wong in The Golden Child- wierd). Mads Mikkelson is awesome, giving the menace of a zealot, believing he is right, definitely in his comfort zone - looking forward to seeing him as Galen Erso in Rogue One. There are many notable performances in this Rachel McAdams holds her scenes with Benedict and provides subtly to the back story. However besides the Lead Man there are two fantastic supporting cast members - Chiwetel Ejiofor, oozes his own brand of zealot in his portrayal of a man submerged by belief and Dr Strange's saviour. His portrayal has the same unflappability that he portrayed in Serenity when he played The Operative. Class. Wong played by Benedict Wong gives a subtle performance as the burgeoning valet to Doctor Strange and gives us some of the best humorous side lines. The effects in this film are first rate - In fact cinemas should come with a pause and rewind button, as some of the scenes are so packed with subtleties, blink and miss them. 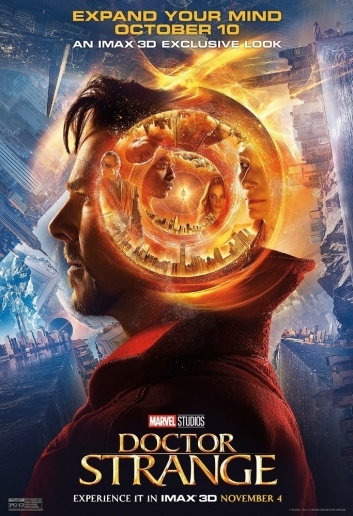 The storyline cradles the viewer, soothing them as it translates one of the more complex marvel comic book storylines into a 1hr 55min spectacle. Although this film has great settings and superb camera work this film, because of the complex comic book storyline, should not translate this well to screen. But it does.